Instant Imprints Ottawa, ON | Custom T-Shirts, Embroidery, Signs & More! At Instant Imprints Ottawa, our customers come to us when they want to be more visible to their customers. We create that visibility five different ways: Branded Apparel (embroidery), Signs & Banners, Promotional Products, Custom T-Shirts and Print Services. Whether you are looking for custom t-shirts, banners, printing services or other promotional products, Instant Imprints® has what it takes to take your business to the next level. When you stop in at your Ottawa Instant Imprints center, you’re taking a big step toward increasing your brand visibility and expanding your customer base. All of this is done locally in a personalized way that online ordering just can’t match. Whatever your marketing vision is, our Image Experts can help you make them happen, right here in Ottawa. We all know the power of custom t-shirts, so it’s important to make sure they’re done right. Our Personalized T-Shirt Service brings you state-of-the-art design, printing and embroidery processes with a value that can’t be beat. T-shirts and other custom apparel can be used for giveaways, employee uniforms or put up for sale as a way for customers to show their support for your brand. When a customer sports your custom tee, they’ll be showing off your logo wherever they go. This means your brand awareness can spread virtually anywhere. 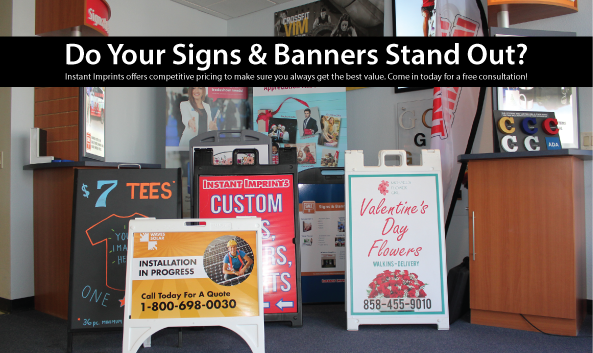 Custom signs and banners are one of the most popular forms of advertising. They are effective ways to demonstrate the power of your brand through a range of sizes and designs. Banners are portable and reusable, inside and out, so you can bring your message to the masses wherever they may be. Whether you want a sidewalk sign to put up outside of your storefront or a huge banner to span across a building, Instant Imprints can help you design and print your banner or sign in a way that can help your business boom. At Instant Imprints, we emphasize the need to get your job done right the first time. This helps you avoid the costly corrections that frequent cut-rate service providers and in-office printing. In addition, we make it a point to have your goods delivered on time—or early. The personal, local touch offered by our Bank Street crew combined with our company values means that your goals will be understood and your goods will be delivered in the best way possible. Why Choose Your Ottawa Instant Imprints? Instant Imprints offers many competitive advantages that make us your best choice for all of your promotional needs. When you stop in at your Ottawa Instant Imprints, you’ll begin a one-on-one connection with an Image Expert who will work to understand your advertising vision and make your brand goals a reality. Your promotional plan will be in good hands. Are you asking yourself, where is an Instant Imprints near me? Pay us a visit at our Bank Street showroom, give us a call at (613) 695-8689 or request a quote today and get your business the attention it deserves.